The "Parque del Buen Retiro" -one of Madrid 's largest parks, was established in the sixteen hundreds as a place for the royalty to relax during lent and the periods of mourning. Actually, the 140 green hectares of today's park is just a fraction of the original park where there were numerous palaces and royal residences. 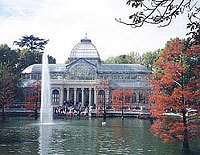 This park is one of the favorite places of the residents of Madrid and it is a must on every tourist's itinerary. A promenade on the park must include a visit to the Crystal Palace -a greenhouse built on iron and glass of the eighteen hundreds, and to the Palacio Velazquez. The "estanque" (artificial lake) can be appreciated either comfortably seated next to the Equestrian Statue of Alfonso XIII or navigating its waters on a rental boat. A common extension to the itinerary in Madrid is a visit to the Monastery El Escorial, located less than 50 km away from the capital. The monumental complex, built by Phillip II in the shape of a "grill" to honor the Martyr Saint Lawrence, is among the favorite destinations for the international tourists. It is difficult to prioritize the things to see due to the richness of this complex. Here are some of the must see sites of your visit: the Basilica that houses 44 altars, the royal apartments, the halls of the battles, the Chapter Houses where the work of Spanish and Italian masters of painting can be admired, and the Library that houses over 40 thousand volumes. Among the most famous soccer stadiums of the entire continent, the Santiago Bernabeu is probably where the most number of triumphs have been celebrated during the past few years. The legendary Real Madrid plays it home games in this stadium after the 50's. The Madrilean team is one of the most famous soccer teams in the entire world. Inside this stadium there is an exhibit of the numerous trophies, as well as some paraphernalia of the champion. If the visit to the Stadium is reserved to the adults, the Parque de Atracciones is reserved to the entertainment of the little ones. Located inside the Parque de la Casa de Campo, this park offers both the classic attractions of The Park of the Moon as well as other zones dedicated to the discovery of antiquity, nature and fantasy. To have both parents and children agree, there is the Zoo - Aquarium also located at the Casa de Campo. It is worth a visit for the perfect simulation of the habitats of both the Zoo and the Aquarium -that features also a dolphin show. It is the most important event of the year for Madrid . It is the feast that celebrates the life of the beloved patron of the city and it represents a must for the citizens of Madrid . It starts the 15 th of May with a series of concerts, exhibits and spectacles where it is not hard to find people dressed with the typical "Castizo". The most important event is the "Festival Taurino" that fills the legendary "Plaza de Toros de la Ventas" for an entire month with daily bullfights. Among the protagonists of the "Golden Century" -the famous Spanish period between the fifteen and sixteen hundreds, Miguel de Cervantes and Felix Lope de Vega embodied the Madrid of their time. The writer of Don Quixote was born in the Madrilean province of Alcalá de Henares , and was buried in the capital. His birthplace -33 km away from Madrid , celebrates his life with the special "Tren de Cervantes," that departs from the Atoche Train Station and takes the tourist to the discovery of the Birth house of the writer. 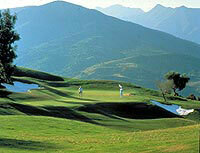 Lope de Vega embodies the inspiration of the Madrilean Atmosphere through his activities of comedian and poet. His House (now also a museum) still contains the furniture of the author and is located on the Cervantes Street .